Mr. Sami at the reception was very helpful and nice. nice staff and supper helpful .I arrived to hole at night around 8:30pm ,I liked the warm welcome that had received. The location is very good, the staff were good especially Ms. Hanan, at the reception. The staff were extremely helpful and polite. The staff at the reception Mr Sami did everything to make our stay comfortable and enjoyable. The location is good and they have free parking. The music on the lobby was simply amazing. We requested for an upper floor and we received a positive answer. The air condition not working when i called the reception they told me in this time we are not using the AC in all the hotel!!!!!! Why ????? 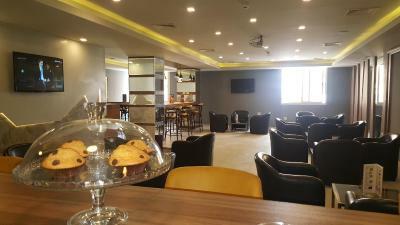 We have stayed in this hotel on many occasions.All the staff are always helpful and polite.The hotels room are spacious it has an excellent restaurant and bar .And is in a great location in Tunis. Yadis Ibn Khaldoun This rating is a reflection of how the property compares to the industry standard when it comes to price, facilities and services available. It's based on a self-evaluation by the property. Use this rating to help choose your stay! Yadis Ibn Khaldoun is located in heart of Tunis business district and 20 minutes from the Tunis-Carthage Airport. It offers cozy air-conditioned rooms with Satellite TV and a private bathroom. The restaurant provides a varied cuisine including Tunisian specialties. Set in a relaxing environment, the bar serves drinks throughout the day. Front desk is open 24 hours, and Wi-Fi access is available in all areas of Yadis Ibn Khaldoun. There are spacious conference rooms that can accommodate up to 120 people. Yadis Ibn Khaldoun is the ideal base for the discovery of Tunis and the nearby Medina. When would you like to stay at Yadis Ibn Khaldoun? Satellite TV and individual-control air conditioning are included in the rooms. House Rules Yadis Ibn Khaldoun takes special requests – add in the next step! Yadis Ibn Khaldoun accepts these cards and reserves the right to temporarily hold an amount prior to arrival. Polite stuff, clean rooms, good food ! We ll come back there every time we are in Tunis! The staff went above and beyond to help me have the best stay possible! A special mention to Sami, who helped me plan the rest of my trip around Tunisia, right now to the hotels! His recommendations were excellent. I couldn't use the wifi. I bought a prepaid cell so that ı had internet. when i booked this hotel, photos were looking fancy but in fact this is an old hotel. Breakfast was very poor.